The cause has been identified and a fix will be included in version 1.7.9 which should be published in February 2016. What happens when the "Show Port Names" button is pressed is a WMI (Windows Management Instrumentation) query is sent to Windows for all PnP devices (a broad net to get both physical and virtual serial ports). WMI is used because it includes an attribute called the 'caption' that usually includes a vendor name or something similar to help identify ports. The way the data returned from the query was refined to only include COM ports works on Windows 7 and prior but not on Windows 8.1 and 10. This function only impacts the ability to see the port names associated with each COM port number. The COM port selection drop-down list uses a different API call to obtain the available ports (minus the port names) and is not affected. So your ability to choose a port isn't affected, just your ability to figure out which port is the Alpha virtual COM port. Again, the cause has been identified and the fix will be included in version 1.7.9. While the monitor is fully UAC compliant, the Colt loader isn't. This means it will try to write to files where only programs should be stored. 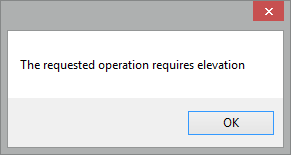 The cause of the elevation prompt above is having the Colt loader in a UAC-controlled path like C:\Program Files\Colt. The fix is to put all the Colt-related files in a directory not managed by UAC - i.e. outside of C:\Program Files\ and C:\Program Files (x86)\ sub-directories. Note that the Colt loader isn't a program I wrote so I have no control over it's behavior. This is fixed in version 1.6.7. The issue was introduced in version 1.6.6 and only affected this version. When the Config and Stop buttons were clicked, the monitor left the amp in a state where it would ignore subsequent commands - including those from the boot loader. This was a long-standing issue but is resolved in monitor version 1.6.6. The default display resolution in XP, Vista and Windows 7 is 96 DPI. If you change the resolution to anything else (typically 120 DPI) or you use a tablet with Windows 8.1 both the monitor and the EEPROM utility make not appear quite right. This is an annoying attribute of Windows Forms (aka WinForms), the legacy Windows model and how it forces or attempts to force elements on the window to scale. Instead of finding a way to allow everything to scale uniformly I have attempted to prevent scaling starting with version 1.6.3. The monitor and EEPROM utilities are usable when viewed at non-standard DPI but pretty nasty looking. The only real fix is to use them at 96 DPI. These occur with firmware prior to 2.02c and are due to efficiency being reported > 100% via telemetry. The calculations for waste heat and plate dissipation both have a (1 - efficiency) term that makes the result negative if efficiency is > 1. This is resolved with firmware 2.02c. This is actually an issue with the 8410 high voltage metering resistors not the monitor. See the Plate Voltage Issue page for details. Telemetry from the amp while plugged in but not on may report nonsensical plate voltages and other parameters. The program just parses what the amp sends. It doesn't mask nonsensical telemetry. Once the amp is turned on everything should be sane. Firmware 2.01c and later are supported (on both the 8410 and 8406). Anything earlier requires a firmware update. This is a known problem. Initially the monitor was quite prone to hanging on close, Stop or Config button clicks. Before I resolved that in 1.6.7 I used a different threading scheme in the EEPROM utility as a test for a means to fix the monitor. Well, the fix for the monitor works very well and the EEPROM utility still locks up frequently. I'll re-work that soon so it's as reliable as the monitor. Utility reports "Power-on detected. Power amp off and try again" yet the amp is off. I've noticed that the utility is more likely to falsely determine the amp is powered on after the monitor has already been communicating with the amp. This is on the bug list and is being investigated. Oh, and yes the utility will typically hang after reporting the power-on detection. It's on the bug list. If you notice bug or quirks, need support or just want to comment on the monitor, drop me an email.